Last weekend we had some fun working on both indoor and outdoor portraits for TJ. This was one of our final shots – a deliberate multiple image setup at a very cooperative dealership. Out on Route 19, the folks at Porreco Nissan set up this amazing 370Z convertible for TJ. 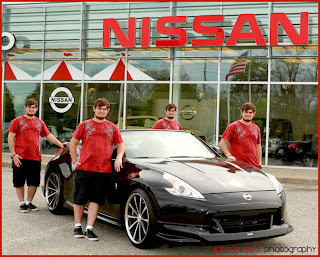 He was fond of another multiple exposure car image that I took a few years ago, and we set it up right out front of the dealership on an overcast afternoon. The reflections were amazing, and I stayed quite still as we composed the various poses and photographed them. It was a quick editing session to stitch them together. I’m sure the Nissan folks aren’t too sad to see their logo displayed several places! Thanks again to the staff and especially the owner of this lovely vehicle.